It’s official! 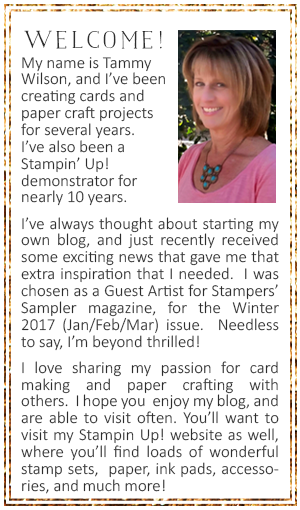 I’m a published Guest Artist in the Stampers’ Sampler Winter 2017 issue! I’ve had several cards published in Stampers’ Sampler and Take Ten over the past couple of years, which was super exciting! However, being selected as a Guest Artist has been the “icing on the cake”! Stampers’ Sampler and Take Ten are both wonderful sources of inspiration for me, and I love that each issue is jam packed with amazing creations, projects, and ideas!